Can someone explain how to use Notepad++ to validate an xml file against an xsd. There are no options in the "XML Tools" plugin dropdown that provides for specifying an XSD file. The XML plugin is installed properly in the plugins subdir and the 3 DLLs are copied to the Notepad++ EXE subdirectory. 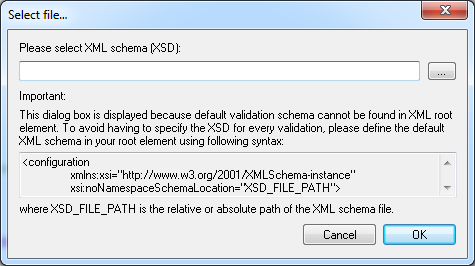 Other XML "validation" features work but there is no way to validate against an XSD. Open XML document you want to validate and click Ctrl+Shift+Alt+M (Or use Menu if this is your preference Plugins > XML Tools > Validate Now). Click on .... Point to XSD file and I am pretty sure you'll be able to handle things from here. 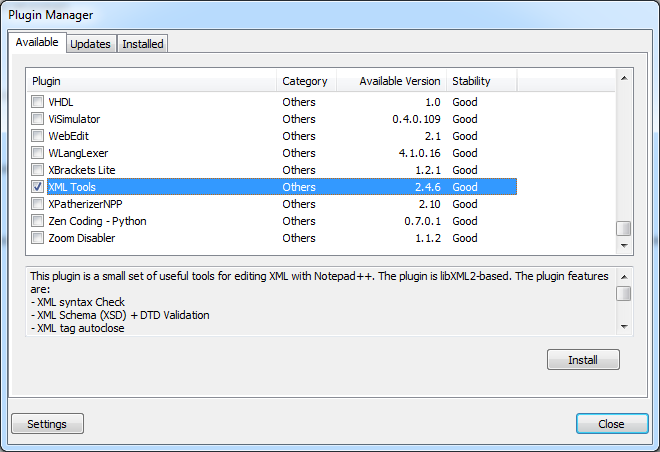 EDIT: Plugin manager is not included in new versions of Notepad++ because many users didn't like commercials that it used to show. If you want you can get it on github, and install it by extracting the archive and copying contents to plugins and updater folder. Not the answer you're looking for? Browse other questions tagged xml xsd notepad++ or ask your own question. How to validate XML against multiple XSD files?